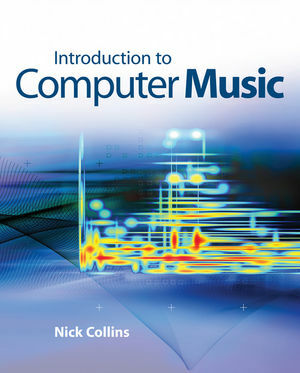 An up-to-date, core undergraduate text, Introduction to Computer Music deals with both the practical use of technology in music and the key principles underpinning the discipline. It targets both musicians exploring computers, and technologists engaging with music, and does so in the confidence that both groups can learn tremendously from the cross-disciplinary encounter. It is designed to approach computer music as its own subject and strongly bridge the arts to computing divide, benefiting and reconciling both musicians and computer scientists. You will need little or no prior experience of computer programming itself, and may not have an extensive background in mathematics or music, but this highly engaging textbook will help you master many disciplines at once, with a focus on both fascinating theories and exciting practical applications. Dr Nick Collins is a composer, performer and researcher in the field of computer music. He lectures at the University of Sussex, running the music informatics degree programmes and research group. Research interests include machine listening, interactive and generative music, audiovisual performance, sound synthesis and music psychology. He co-edited the Cambridge Companion to Electronic Music (Cambridge University Press), and is fond of the non sequitur. He is an experienced pianist and computer music performer, and active in both instrumental and electronic music composition. 1.1 What is Computer Music? 1.1.1 Some Examples of Computer Music. 1.1.3 Why Investigate Computer Music? 1.2 Quickstart Guide to Computer Music. 1.2.1 Sound Waves and the Brain. 1.2.9 Patching, Signal Flow and Unit Generators. 1.2.11 Programming and Computer Music. 1.2.12 Representing Music on a Computer. 1.3 A Whirlwind History of Computer Music. 2.2 Musical Instrument Digital Interface. 2.4 File Formats and Audio Codecs. 2.5.1 Spatial Hearing and Room Acoustics Primer. 2.5.2 Surround Sound Configurations and Multichannel Formats. 2.6 Recording Tips and Tricks. 2.7.1 A History of Sampling. 3.2 Fourier Analysis and the Phase Vocoder. 3.2.2 Further Refinements to Fourier Analysis. 3.2.3 Resynthesis after Sinusoidal Modeling. 3.2.4 Not All Sounds are Periodic: Coping with Noise. 3.3 Alternative Representations for Analyzing Sound. 3.4.1 Physiologically Inspired Models of the Auditory System. 3.4.2 Computational Auditory Scene Analysis. 3.7 Machine Listening and Causal Realtime Analysis. 4.1.1 Signals and Sampling Rates. 4.1.2 Ring and Amplitude Modulation. 4.2.1 Impulse Responses and the Convolution Operation. 4.2.4 Examples: Comb andAll-pass Filters. 4.3 ACompendium of Marvelous Digital Audio Effects. 4.3.1 Dynamics Processing, Distortion and Waveshaping. 4.3.2 Time Stretching and Pitch Shifting. 5.1 The Space of Sound SynthesisAlgorithms. 6.1.2 Directness of Control and the Physicality of Gesture. 6.2.1 A Survey of Input Devices. 6.2.3 Audio and Video Tracking. 6.4.3 Programming the 'Brain' of aVirtual Musician. 7.1.2 Network Music and Installations. 7.1.3 Further Network Music Ensembles and the Laptop Orchestra. 8.1.1 Musical Decisions: TheAct of Composition. 8.1.2 Roles for Computers in Composition. 8.1.3 Computer Music and Musical Style. 8.2.1 Sound Objects and Parameters. 9.4 Modeling of Musical Expression. 9.6 The Information Characteristics of Music. - An essential first point of reference introduction to the field. - An emphasis on accessibility and a strong didactic approach. - Applicable to many different software packages without dependence on any single one. - Pathways through the book to avoid or embrace mathematical detail.